Get Smart: One of the latest trends in home comfort and energy control is a smart, or programmable thermostat. This technology allows temperature settings to be programmed around your household’s needs, schedules, and occupants. It can also result in energy and cost savings if used correctly. Tip: You may not get the programming accurately right off the bat, so don’t just give up and start overriding it manually. Custom Climate Concepts is happy to help you re-tune and adjust until it’s all systems go! After that you may want to change the settings a couple times per year as humidity changes will make the same temperature feel different. Night Matters: In Florida, summer temperatures get at least slightly cooler at night and in winter can drop more dramatically. Small adjustments to your indoor climate, before going to bed, can help fine tune the too hot/too cold conundrum. It can also add up to reduced energy use and costs. Tip: Be aware that you may need to tolerate slightly warmer temperatures to garner real cost savings. Ceiling fans are very helpful. Find The Zone: Another advance in HVAC technology are systems that use multiple thermostats to cool or heat different parts of a house by zone. This can be a great option for regulating different temperatures for everybody. Tip: In addition to personal preference, there may be different rooms, or areas, of your house that run hot or cold. Zoned systems can adjust for these factors as well. This is especially important in two story homes. 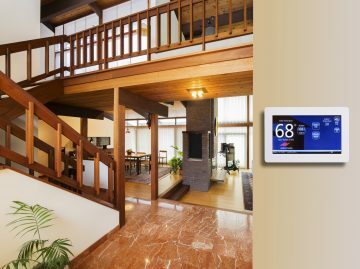 Learn more about programmable thermostats and zoned systems by contacting Custom Climate Concepts at 941-955-COOL (2665).